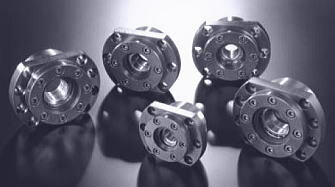 BUT series | Products | Kuroda Precision Industries Ltd.
Products of this series are available for use with ball screw shaft diameters φ25 to φ50. Designed compact considering the space around the mounting area, the support unit can be mounted without any preparation as the high-precision thrust angular contact ball bearing for ball screw inside the unit is already appropriately preloaded. In addition, the special lock nut for bearing with built-in looseness preventive function allows for high-precision mounting. High precision, high rigidity are achieved in a stable way by using DF type thrust angular contact ball bearing with accuracy grade P4 and contact angle of 60º, in addition to enclosing an appropriate amount of grease inside the bearing. Seals are provided on both ends of bearing for dustproofing.